These adorable women certainly are not Desperate Housewives. In fact, these beauties were inspired by the iconic 1950’s housewives, but with a modern twist and a more vibrant color palette! Thanks to Kio Kreations, La’Di Events, & RBK Creations for styling this amazing shoot. 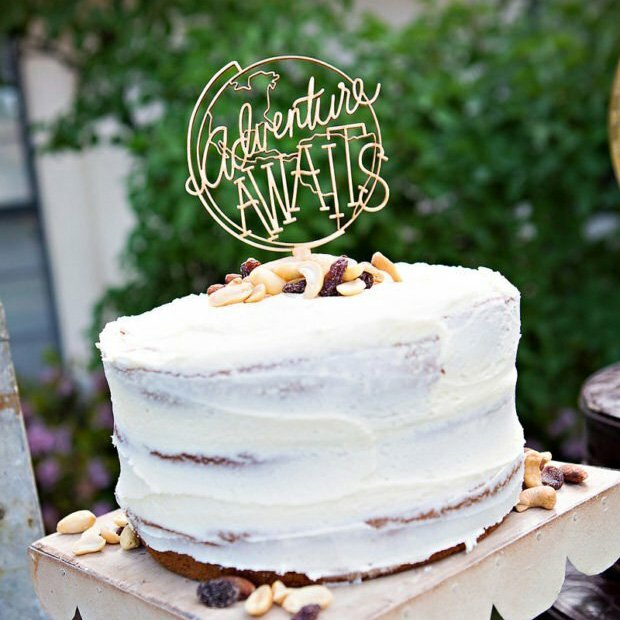 This is such a creative way to celebrate a bridal shower or a birthday party. What women doesn’t like to get all dolled up and celebrate?! 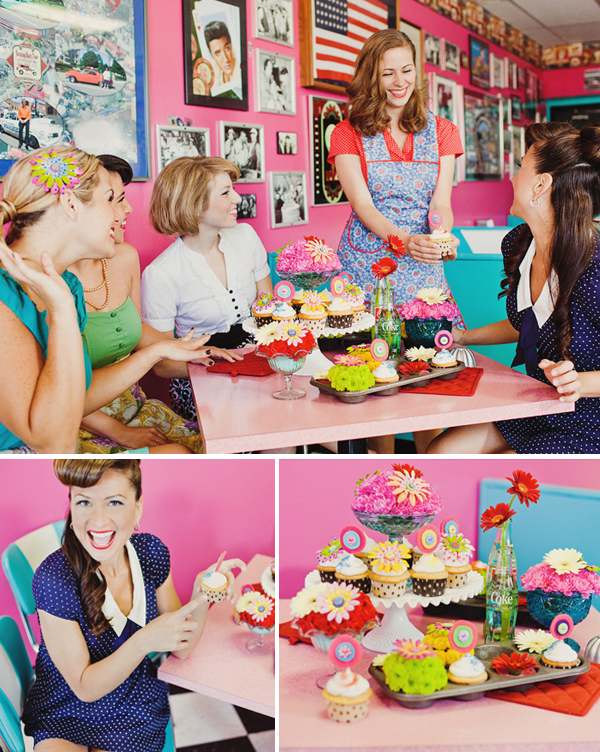 The retro diner atmosphere and vintage-style clothes, aprons, makeup and hair-dos were accompanied with gorgeous flowers, colorful hair accessories, and scrumptious cupcakes to make this theme unique and memorable. 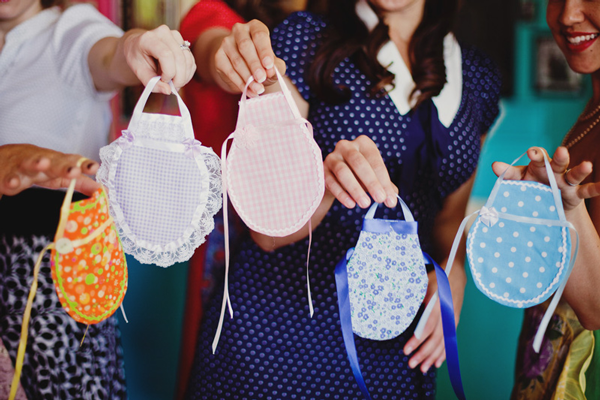 Did you notice the super cute mini-soap aprons? 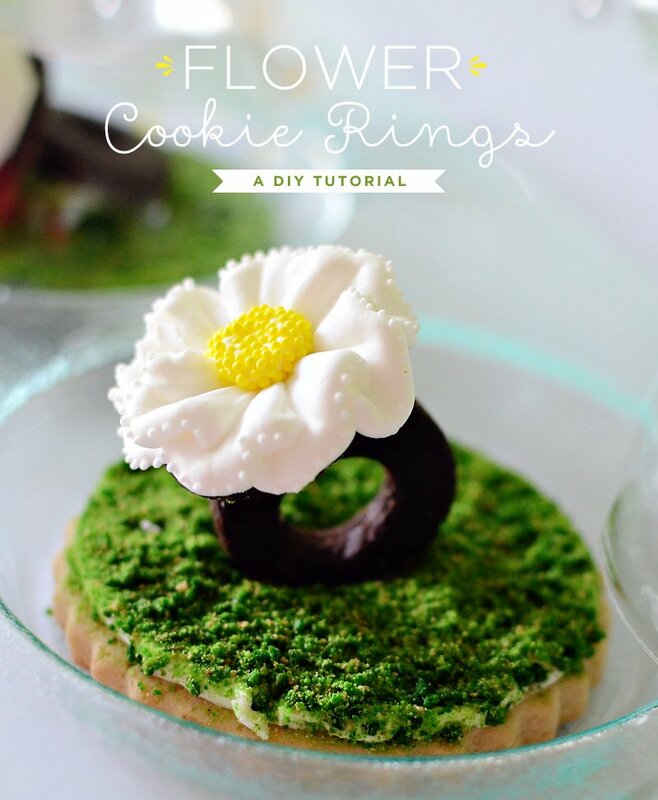 Click here for the DIY on these little keepers! 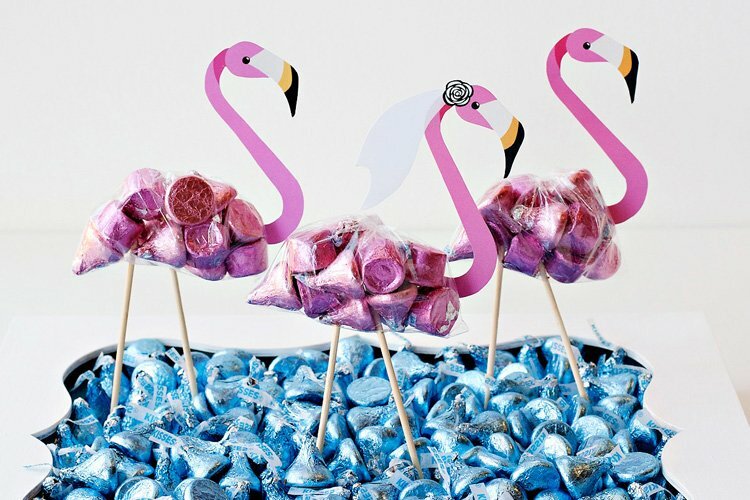 This theme is such a great way to get your guests really involved in the party. 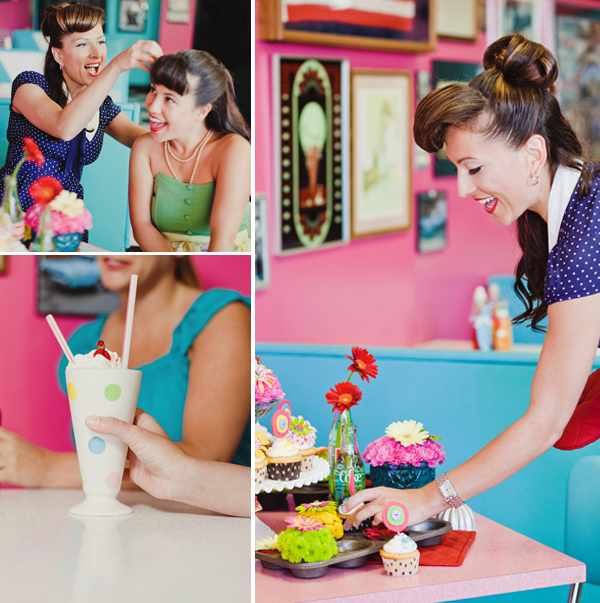 You can use this idea for kids parties too – I’m actually planning on throwing one of my little ones a “diner” inspired birthday party! Keep reading for more AMAZING photos + party details. 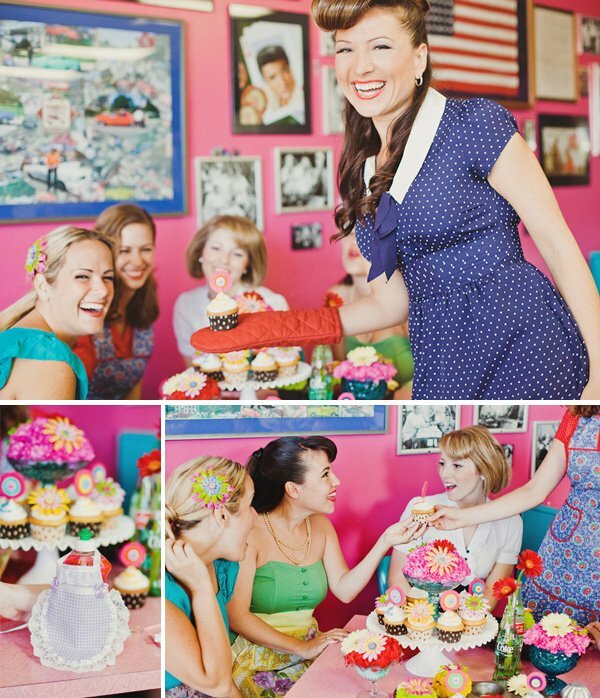 . .
“Inspired by ‘1950s housewife meets Katy Perry and Dita Von Teese’, we came up with a bright, cheeky bridal shower theme that every Peggy Sue would love to be a part of! And what’s more fun than getting dolled up like a happy 1950s housewife? Making all of your girlfriends join you in the fun! Of course, no 1950s wife-to-be would be complete without a scarlet lip! To modernize the look, a cherry red lipstick with a little bit of clear lipgloss was applied to all the guests at this shower. Some flirty faux lashes and winged eyeliner completed their retro look. Soft waves, short rolled bangs and feminine curls that bounce inspired the hairstyles. 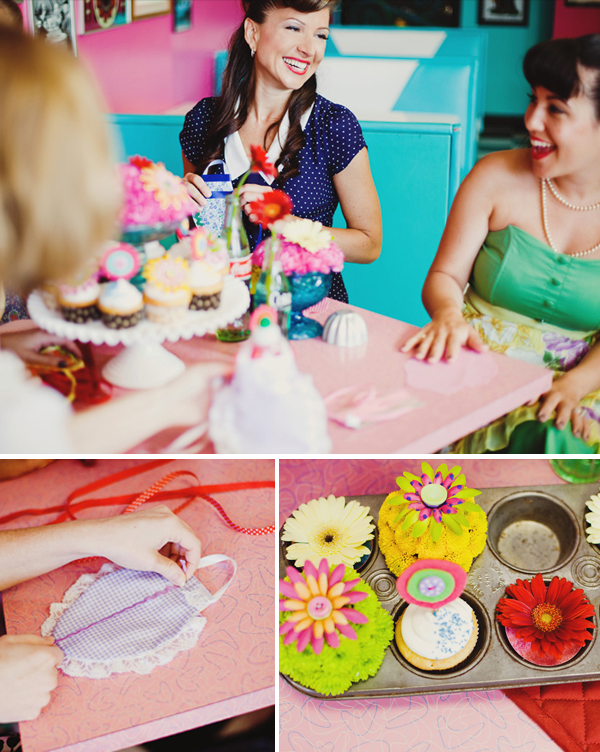 All of the ladies also dressed in 50s styled dresses and wore adorable vintage floral aprons. 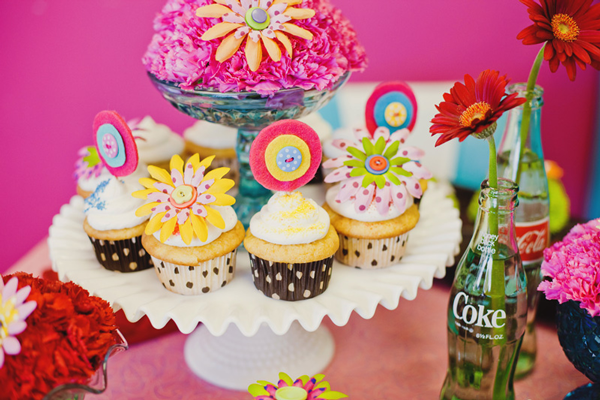 We put out the perfect spread of vintage cake stands, cupcake trays, and Coke bottles and made faux sundaes with the ‘IT’ flower of the 50’s—carnations! We also included cheerful gerbera daisies in the mix. All of our “desserts” were topped with polka-dot button flowers, which also adorned some of the yummy vanilla and chocolate cupcakes. 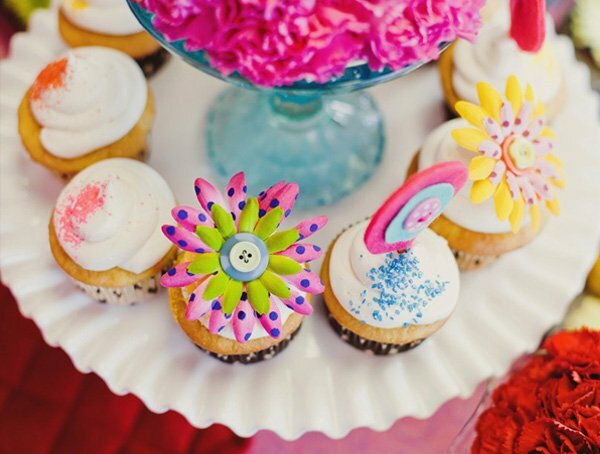 A few of the cupcakes were additionally decorated with felt polka dot cupcake toppers. Button bobby pins with 3-D flowers, rhinestones, and fun stacked buttons served as the favors for the bridesmaids! They also had a blast making little mini aprons for their dish soap bottles to wear. We’ve included the DIY for this, which we saw demonstrated on HGTV’s ‘That’s Clever!’. About the Author: Jessica W.
JESSICA WILCOX of Modern Moments admits to being kept awake by new creative ideas. Friends are amazed that she no sooner has a great idea for a new product than it appears on her website – beautiful and ready for customers! This artistic, high-energy entrepreneur with a degree in business discovered her flair for design as she settled into domestic life in Portland, Oregon, with her husband and first son six years ago. 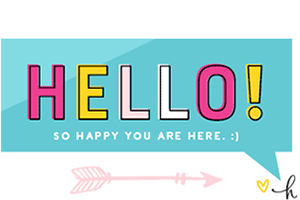 Since then, she’s had two more adorable boys and has begun two flourishing design-related businesses, one for custom home décor and one for print goods and party supplies. 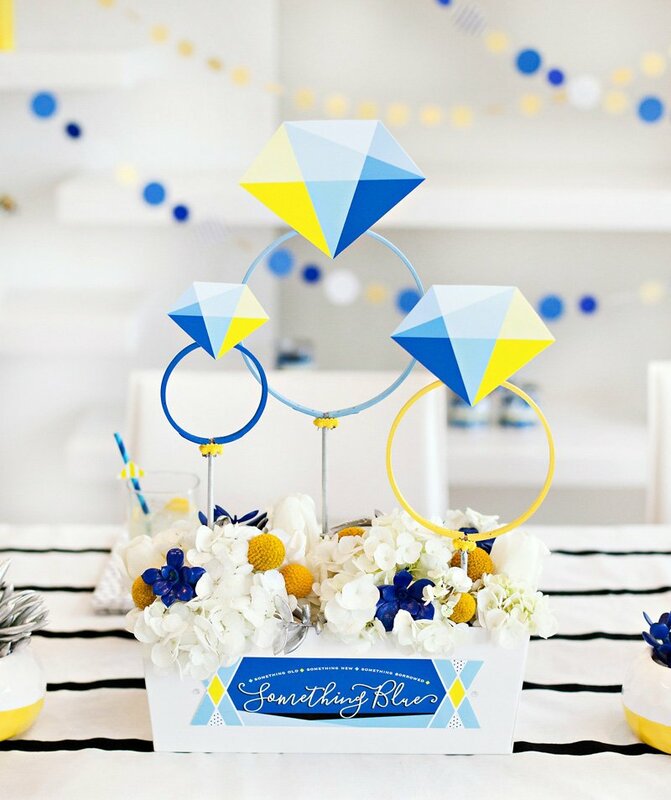 Her flair for party details is the reason she is now developing a third business. 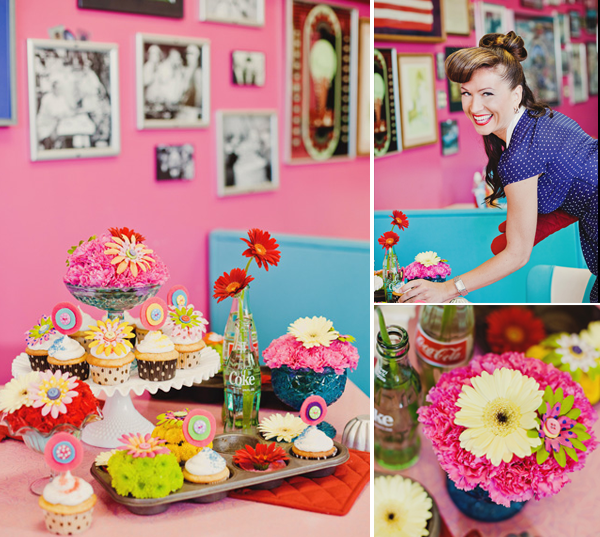 A lover of “all things cupcake,” Jessica not only creates unique party décor but loves to cook savory snacks and bake sweet treats that creatively express the event’s theme. 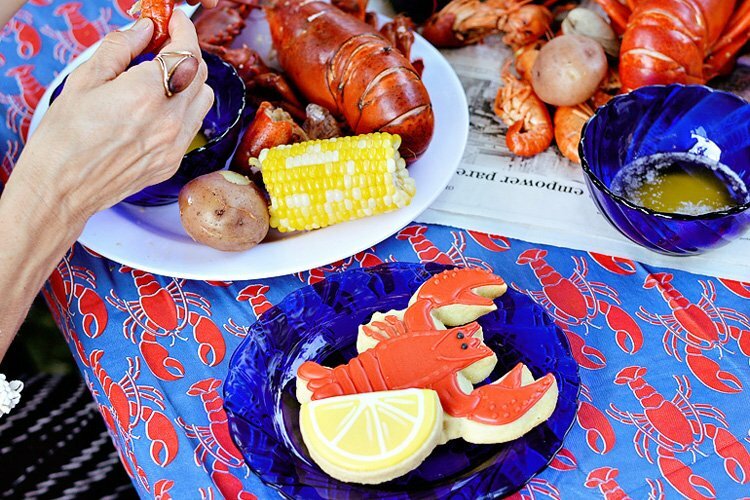 Lucky family members get to enjoy her design and culinary creations on a regular basis, and she’s now ready to share her party planning brilliance with the world. Watch for it! How original!!! I love the bright colors and the retro look. Fabulous job! I saw this at Kara’s Party ideas! SO cute!!! Offbeat brides would love this! 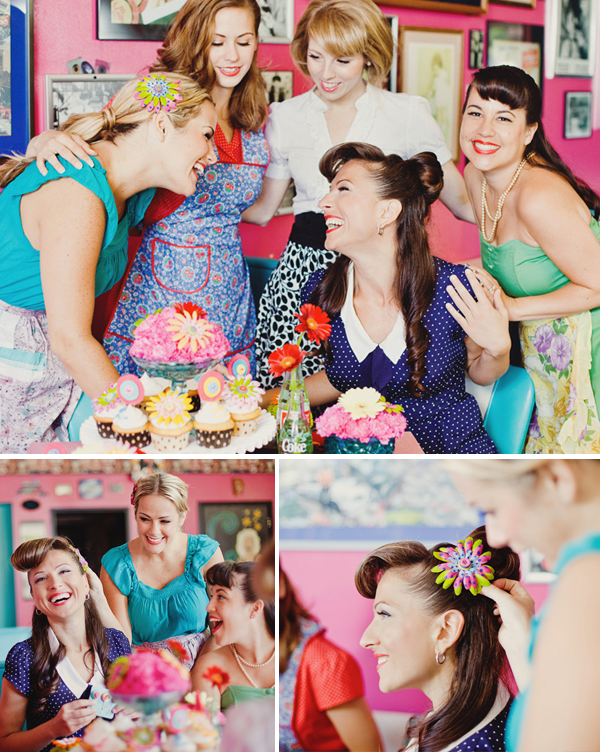 Thank you so much for featured this shoot–we had such a blast making this party happen!! What a fun bridal shower! Great idea. This is an adorable idea! I just love all the bright colors!! Oh! My Goodness! I LOVE, love, love the concept! 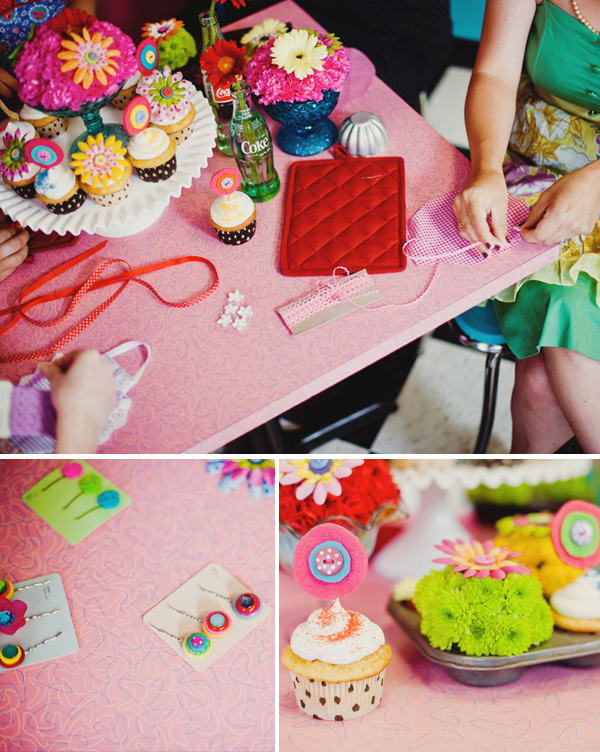 Fantastic theme for a bridal shower! I appreciate ALL the details that was put into this beautiful special event! Congrats!!!! where is the blue and white polka dot dress from. i want to buy it!! !